Prefects are seniors who possess a high degree of commitment to the school’s values and ideals. They are capable of overseeing the work in their particular areas and managing the underclassman involved therein. The emphasis of their jobs is service, not privilege. All prefects should participate on voluntary basis and each should have cooperation with his or her own committee, involving students from all grades. 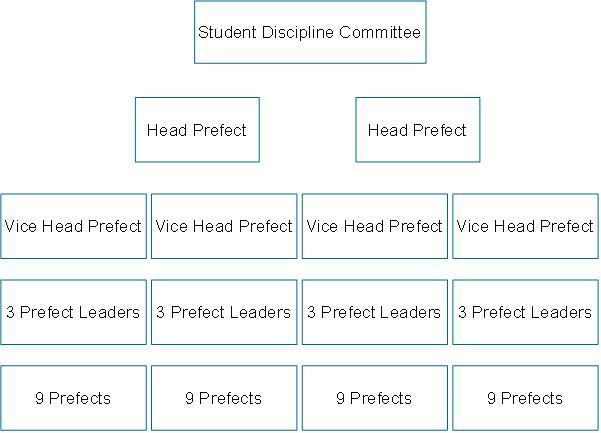 The organization of the Prefect system is as follows, The Prefect Program provides a link between students and school, strives to welcome new members of the student body, and works to ensure the well-being of student members of school. Prefects are leaders who are trained and selected in the second term of each year. Several Prefects are appointed from various houses, and as leaders in the house, Prefects set the standard for fairness and objectivity and recognize the need to intervene and seek guidance in times of crisis. Their goal is to make your life at School welcome, comfortable, safe, and enjoyable by setting positive examples for all who live and work in the house. Evaluation of all prefects is conducted in each academic year. All candidates must proceed to the board and are interviewed and evaluated by the Student Discipline Committee for consideration of their application to promotion. Prefects are students who have demonstrated exceptional leadership potential and are therefore the delegated representatives of the school. They are appointed to the position by their teachers and by the Discipline Committee of the school. Prefect’s responsibilities include liaising with the Lower and Middle Forms, running assemblies, working with the school programs, and generally overseeing student life, including arts, social, academic and sports related opportunities. They function together with the teachers as well as all superiors to help create a cohesive and effective Student Leadership program at the school. The Head Prefect is usually a student who has achieved remarkable things in many aspects of school life. The Head Prefect is regarded as having the top leadership position at the school and his main duty is to oversee the Prefects and help with their portfolios. * to do my duty as a prefect of the PLK Laws Foundation College. * to foster friendship, fairness and equality at this school. * to respect every individual. * be a responsible member of our school. * to be helpful to all students and staff. * to lead by positive example and to obey the school rules.